I’ve been growing increasingly interested in the technology that underlies our transportation systems. Traditionally, technology in a transportation setting refers mainly to engineering processes, products, materials, and analysis. Increasingly, however, technology’s ubiquity in our personal lives is enabling cities to improve encouragement and promotion, crowd-sourced auditing of system quality, way-finding, and passive data collection related to our transportation networks. Transportation planning (in the US) largely takes place at the regional scale. As a simplification, federal money is filtered through “metropolitan planning organizations” (MPOs) who are responsible for projecting trends on a regional scale, setting goals for the local situation, and planning infrastructure projects to meet local demand and goals. This process largely is facilitated by the occasional MPO-administered travel demand survey, whereby several households are selected at random and asked to report household characteristics and travel behavior. There are several issues with this, not the least of which is the sheer expense of administering such a survey. But, here I would like to focus on one specific weakness: bicycle data. These surveys are designed to capture a representative sample of a local population and describe their current travel behaviors. 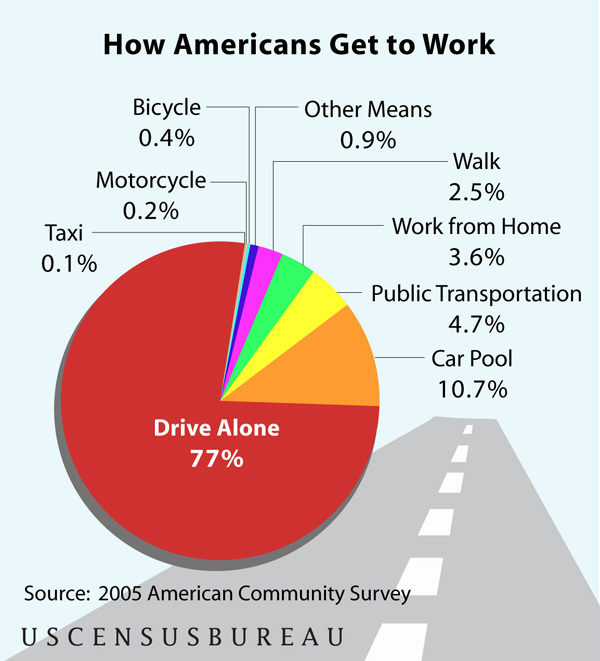 According to the 2005 American Community Survey, only 0.4% (yes, half of one percent) of Americans use a bicycle to commute to work. So, when MPOs survey their residents on travel behavior, they often receive only a handful, if any, responses indicating the use of the bicycle for transportation. The reason that this becomes a weakness in our established regional transportation planning methodology is that with such few responses, there is no statistically robust technique for modeling this population’s behavior – not even enough to guess current travel behavior, let alone how they might travel in 15, 20, or 25 years. Modeling bicyclist travel behavior is a topic that I am only starting to delve into personally, so forgive any naïveté on my part. But, I think it is important that people who are interested in mobility and access, in technology, and in “smartening” government processes should know the current limitations and the opportunities that improvements in technology can bring. The article that inspired me to write today is this one, from the San Francisco Chronicle. It highlights $33 million of federal transportation funds identified for “experimental projects” in the Bay Area. One such project includes the installation in San Jose of “eight systems to detect and count bicycles and then install the best technology on two corridors frequented by bike riders.” This data will help to inform travel models, which will help to inform transportation investments, which hopefully will help to facilitate increased bicycle travel. In my brief research, I also stumbled across this in-progress project from Portland State University. It seeks to gather finer-grained data on this topic of bicyclist travel behavior, which in turn could be fed into the models. Lastly, when you have the time (I’ve still only watched parts of it), see this webinar by Fehr and Peers and the Southeast Michigan Council of Governments titled “GIS-based Bicycle and Pedestrian Demand Forecasting and Traffic Count Programs.” One striking fact is that, currently, the margin of error in models’ mode choice step (when it decides the transportation mode on which a given trip will be made) is greater than the percentage of commute trips made by biking or walking – making predictions for these modes completely unreliable. Moreover, unlike for automobiles, bicyclists’ and pedestrians’ trips are almost never assigned to the network, meaning planners have no knowledge of which streets these travelers use now or may use in the future. The main point to be made is that the bottleneck here is in data collection. Technological solutions such as mobile phone apps, GPS units, and even cell-phone tracking data can help to jump the hurdle, but a more focused effort in coordinating this data collection needs to be made and standardized in order for it to become truly useful to MPOs and other transportation planners.